In general we find clients engaging across a range of activities – some fruitful, some less so – to drive desired growth, which we’ve summarized here. With a solid existing product in hand, most clients begin by transitioning further and further upmarket, striving (and often realizing) incremental pricing power and margin realization. This works for a while, until further growth is sought and then clients often turn to increased specialization at the premium end. A proliferation of customized and specialized products to address profitable niche markets and extract yet further value from the market is often how this plays out in the market. When that strategy begins to lose steam, clients turn to the lower end of the market, and work feverishly making lemonade from lemons. The lemonade in these situations will often take two forms, either the development of new business models designed to enable profit realization at the lower end of the market or mechanisms to fundamentally unlock non-consumption. And when those approaches collectively fail to drive further incremental growth one is flummoxed, and struggling to find desired growth. We’d argue that it’s not that growth potential is not there, it’s just hiding where they aren’t used to looking. Let’s introduce two concepts that we find helpful in surfacing these opportunities from the often over-looked areas of the market. Concept 1: Superconsumers. Who are they? They are the high passion, high profit consumers found in every category. They spend three to seven times more than the average person in a category. 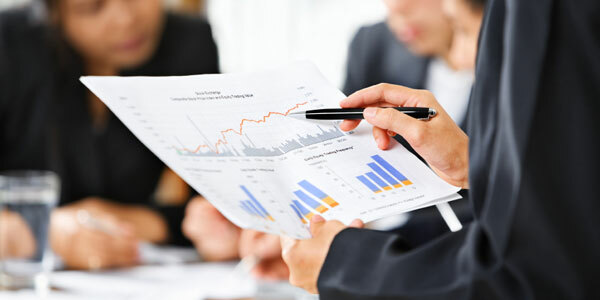 They are knowledgeable on the category (and passionate), willing to pay a higher price per unit and enthusiastically share their expertise and knowledge with others. Concept 2: Jobs Theory. It represents a fundamental shift in our thinking. Consumers do not buy brands and products, instead, they HIRE them in order to create desired experiences and make progress in their lives. Successful innovations fundamentally identify people with important jobs to be done that have only incomplete or inadequate solutions – and then deliver solutions that enable the desired progress people seek. Some jobs are ‘executive level’ jobs meeting rational, emotional and social benefits and others are more ‘entry level’ jobs, addressing primarily rational benefits. The most successful innovations are fueled by converting non-consumers into consumers and intermittent customers into regular, profitable ones. What happens when one overlays these concepts together? New growth opportunities are brought to the surface. 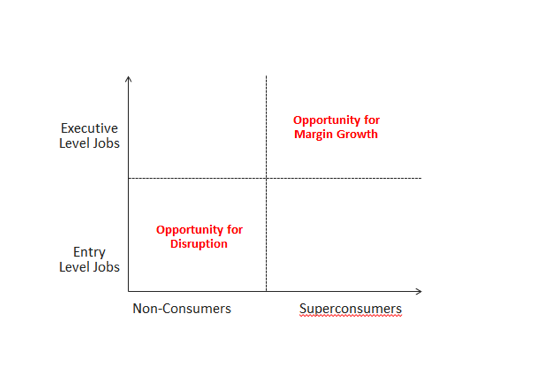 Traditional approaches and frameworks consistently highlight the intersection of Superconsumers & Executive Levels Jobs as they key area for margin growth, and just as many highlight opportunities to convert non-consumers into consumers via successful delivery of entry level jobs, often by category disruptors. Very few, however, surface the remaining two quadrants, but as we’ll describe via several case studies … companies overlook those opportunities at their own peril. Consider for a moment Keurig. One often immediately jumps to a focus on consumers who love coffee and spend more than $600 per year on it. That focus is intuitive, and clearly benefits margin potential. But that’s not really the Keurig story. Instead, Keurig successfully delivered the executive level job of non-consumers and the entry level job of Superconsumers. Really, you say? Consider the following. A dinner party, hosted by a non-coffee consumer, seeking to complete a splendid dinner party with a coffee course, but with little to no knowledge of how to deliver it. Enter Keurig. A great cup of coffee, completely customizable, a perfect finish to a meal and a re-affirmation of your exceptional hosting skills. Executive level job of a non-consumer, satisfied by Keurig. For the coffee Superconsumer the ask of Keurig is decidedly different. For a true coffee Superconsumer Keurig does not deliver their executive level ‘craft coffee’ experience, but rather their entry-level quick cup of coffee on a schedule. Entry level job of a Superconsumer, satisfied by Keurig. The reality, such market opportunities are hidden in plain sight all around you. They are terribly difficult to spot however, until viewed through the Superconsumer/ Jobs Theory lens. Only with this understanding can one truly see the ‘Jobs’ for which consumers are hiring, and the progress they are seeking to make in their lives, and only with that understanding can innovators meet consumers where they are with solutions people will predictably buy, use and celebrate. Eddie Yoon is a Principal with The Cambridge Group and author of the book, “Superconsumers: A Simple, Speedy, and Sustainable Path to Superior Growth“. Linda Deeken is the Chief Marketing Officer of The Cambridge Group. Taddy Hall is a Principal and Leader of Strategic Innovation at The Cambridge Group, and is the co-author of “Competing Against Luck: The Story of Innovation and Customer Choice“.